MD & DDS Resources is the preferred NP and PA recruitment agency of FQHCs across the US. “At MD & DDS Resources our mission is to bring communities, hospitals, and clinics together with dedicated and well-qualified physicians, dentists, nurse practitioners, and physician assistants. As professional consultants we take great pride in providing an informative and rewarding experience for all parties involved in the recruitment process. Our ultimate goal is to provide our clients with clinicians that will administer outstanding care on a long-term basis to the patients in their communities.” We are proud to be the Preferred Medical and Dental Recruiters of FQHCs nationwide and of our long history of placing providers at rural underserved community health centers across the country. Now there’s a quick and easy way to find the NP or PA job you’ve been searching for. Searching for the perfect NP/PA job opportunity can be a time-consuming and overwhelming task. Even if you do everything right—scour the want ads, send out query letters and resumes, network with colleagues and friends—it’s hard not to get discouraged when your efforts don’t produce the results you want. But don’t despair. Finding that perfect job is easier than you think with guidance from theright NP/PA job placement agency. There are two kinds of placement agencies: the kind that generalize and the kind that specialize. MD Resources is a recruitment agency that specializes in finding jobs for Nurse Practitioners and Physician Assistants. 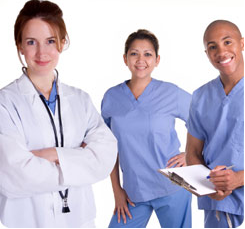 Our organization has over 25 years of experience in the medical job placement industry. We bring a wealth of knowledge and experience to your search for that perfect job opportunity. Over the years MD Resources has cultivated strategic partnerships with hundreds of medical providers—hospital administrators, community health center directors, group practice managers, and medical directors. These partnerships allow us to launch a specific job search and uncover an abundance of available job opportunities for you! Why not let us guide you on your search for the ideal job? Whether you’re a practicing provider needing a change or a new graduate preparing for Boards, looking for the right practice opportunity will be easier with the assistance of our professional recruitment staff. They will guide you through every step of your job search. Starting your Nurse practitioner or Physician Assistant job search is quick and easy! Why wait any longer? Get started today by calling 636-536-6656, or upload your CV and provide your contact information and we will initiate a customized search for you.